Being that I’m a graphic designer as well as a blogger I am on a computer a lot. So, it’s pretty important to me to have a keyboard and mouse that is comfortable, responsive and last. I’ve been using Logitech for years for all of those reasons. Their keyboards are responsive, fast and comfortable for me to type on all day and Logitech mice are comfortable in my hand and very precise, which is great when I’m designing because I need to be pixel perfect. When I first laid eyes on the new Logitech Global Graffiti Collection it was love at first sight. 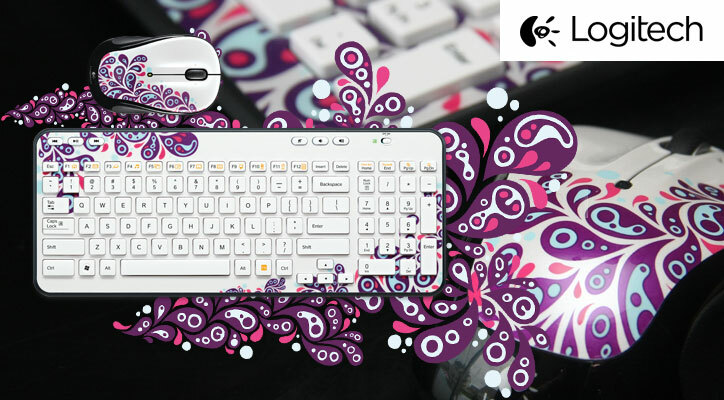 The Global Graffiti Collection of keyboards and mice are unique, colorful and creative. There are 7 different designs each created by an artist from around the globe. I chose the White/Purple Paisley design because it’s so girly and fun, WAY better than a boring old black or white keyboard and mouse! Now that you see how cool they look let me tell you more about performance and features. The Logitech Wireless Keyboard K360 is wireless and has a three-year battery life. I love the hot keys that allow me to open my email, music and control the sound volume. It’s very light and compact too so it’s not bulky and doesn’t take up a lot of space. The Logitech M325 Wireless Mouse is very comfy and has a contoured shape and soft rubber grips on each side. Its very precise which I love because I need to be able to have each pixel in the perfect place when I design. It also has the oh-so-convenient scroll-wheel that makes surfing the Internet much easier. I won’t ever have a mouse without a scroll-wheel, I HAVE to have one. It also can give up to 18months of battery life. Batteries are expensive and I’m always forgetting to buy them so this is going to be a definite plus for me! Logitech has always been my favorite brand of keyboards and mice and with the addition of their fun Global Graffiti Collection it gives my desk a touch of my personality. They are very easy to install by simply plugging in the Bluetooth device the drivers automatically install and they start working right away. Easy! I love my new keyboard and mouse and everyone keeps asking me where I got them! Logitech is giving one lucky winner a K360 Keyboard and M325 Mouse from the new Global Graffiti Collection! To enter fill out the Rafflecopter form below. Ends 7/1 at 11:59PM EST. My favorite is the White/Purple Paisley. I like the White/Purple Paisley. I would definately love to have the White/Purple Paisley, its adorable. Joy Yang. Ireland would be wonderful! Panda Candy is my favorite! The White/Purple Paisley, in my opinion, is the best!